1. Comté – Antony suggests starting out with Comté that is not too old, just one or two years old; older ones are better appreciated by connoisseurs. Vin Jaune, yellow wine made from late-harvest Savagnin grapes, is a classic pairing recommendation. Antony also says mature Sauternes work as well as Riesling. 2. Camembert comparison – Antony suggests buying two Camemberts, one that is AOC (superior) and one that is not AOC (inferior). He strongly believes that Camembert and red wine is a terrible pairing. Reds get a metallic taste with Camembert and can make the tannins taste very hard. He says unoaked whites are best, but it can work with Beaujolais or Alsace Pinot Noir. The best option? No wine at all with Camembert, he suggests. 3. Roquefort – Best pairings are with Sauternes or late harvest sweet wines from Alsace. The strong salty flavours are complemented by the sweet honey flavours of late harvest types. 4. Charolais goat cheese – The best wines are white; try white Alsace or white Burgundy. Because of its fat and creamy style, it pairs well with Chassagne Montrachet. 5. Reblochon – This is one of the easier cheeses to pair with wine. It works with white Burgundy and can pair equally well with lighter red wines like Pinot Noir. When selecting red Burgundy, try a Côte de Beaune or Volnay. If the Reblochon is older then the wine should be stronger in flavour too. When cheese starts to be cut, it needs to be consumed within two weeks. Never keep cheese for more than two weeks in the fridge. The moment to buy cheese is in summer or early autumn. Try to buy cheese made in the summer months. Serve cheese at room temperature, around 20˚C for most cheese, except for a few like Rocquefort, which should be cooler. 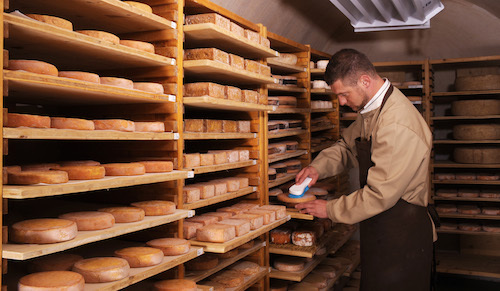 Other places for great cheese besides France are Switzerland – and for hard cheese, Italy, UK and Spain.